We provide 25 laser printed resumes on resume paper shipped with envelopes via Fed Ex. You build focus and confidence to move forward by learning how to research, plan, and stay on track. We also review resumes, letters, LinkedIn profile, interviews — and more. We offer two 1½ hour sessions. You build focus and confidence to move forward by identifying your value to others and crafting your "Elevator Pitch". We also review communication skills (verbal, nonverbal, tone of voice) etiquette, attire, researching, planning, budgeting, resumes, letters, LinkedIn profiles — and more. We offer two 1½ hour sessions. For all inquiries, Prep Your Path provides a complimentary 20-minute telephone or email consultation to discuss services and determine next steps. We strive to provide the highest quality service possible. For resumes, letters, and LinkedIn profiles, we edit until clients are 100% satisfied. However, Prep Your Path LLC cannot guarantee interviews—or academic or professional career advancement or outcomes. Projects begin once the Client has signed the Prep Your Path Client Agreement Contract and provided a deposit of $100 by credit card, PayPal, or Venmo. Final payment is due upon project completion. Absolutely no refunds are permitted once we have processed deposits or payments. Prep Your Path LLC accepts all major credit cards (MasterCard, Visa, American Express, and Discover). To ensure your privacy and protection, you can provide information to Anne Finnegan only by telephoning (914) 249-9280. We do not require a security code number for processing—only the credit card number, expiration date, and billing zip code. We do not retain credit card information on file once final payment has been received. Prep Your Path LLC accepts PayPal and Venmo. (PayPal and Venmo are fast and safe methods of paying for products and services online.) Clients can use their PayPal or Venmo account to transfer funds from their checking or credit card account to our Prep Your Path LLC PayPal or Venmo address. If the Client does not have a PayPal or Venmo account, he or she can set up one online in a few minutes at www.PayPal.com or www.Venmo.com. Obtaining a clear understanding of your objectives and experiences is an important part of our coaching process. To ensure that all necessary information is collected efficiently and effectively, candidates agree to complete the Prep Your Path Candidate Questionnaire for all services in a timely manner. Candidates also agree to additional telephone or email discussions as needed. Once all necessary information has been provided, resume, letter, and LinkedIn profile projects are completed within 3 to 14 days including weekends. Initial drafts are delivered to the Client within 3 to 5 days of the start date of the project. The number of revisions depends on the individual needs of the Client. Revision and final delivery dates are determined by both parties at the beginning of the project, and modified as needed throughout the project. The Client agrees to make reasonable efforts—either by email or by telephone—to provide answers to questions during the intake and follow-up writing processes. Failure to respond in a timely fashion could result in project termination and loss of deposit. Clients recognize that from time to time Prep Your Path LLC may need to extend the project completion date due to workload. Similarly, the Client will advise Prep Your Path LLC if he or she needs additional time to complete a project. All details that the Client provides must be correct and complete. The Client assumes ultimate responsibility for the accuracy of information provided and the sharing of all information based on the advice obtained from Prep Your Path LLC—including final proofreading and distribution of all written materials. 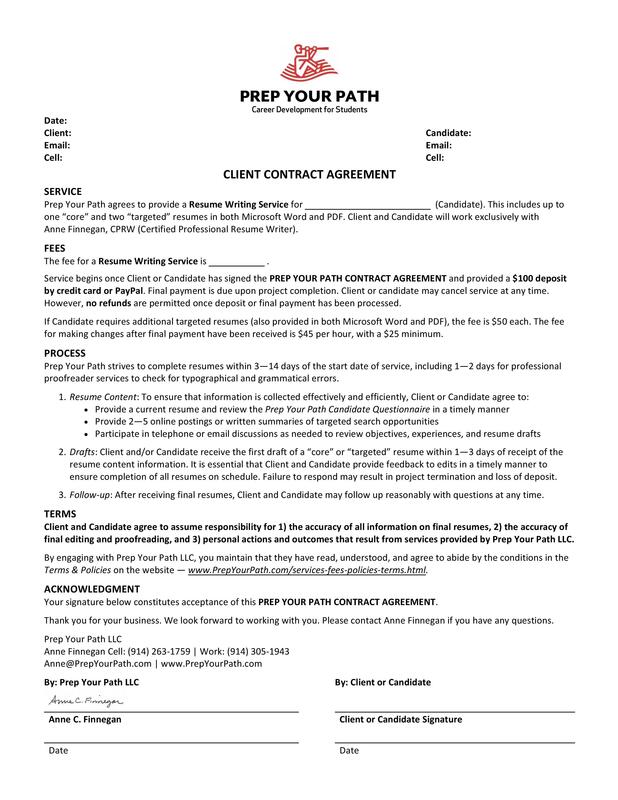 The Client accepts full responsibility for the career search actions taken as a result of Prep Your Path LLC services provided on behalf of the Client and at the Client's request. Prep Your Path LLC is not liable for any inaccurate, incorrect, or misleading information. Furthermore, Prep Your Path LLC will not confirm or attempt to verify information provided by the Client. Additionally, if Prep Your Path LLC believes the details of Client information are not correct or complete, we have the right to terminate the Client Agreement Contract. Maintaining your privacy is very important to us. Under no circumstances will we willfully sell, lease, or rent any of your personally identifiable information (name, address, email, and telephone number) to any third party, except in compliance with the law. Client personal information is collected through our Prep Your Path Candidate Questionnaire only. This website currently has no applications or programs that gather information from your computer without your consent. Prep Your Path LLC advertises through social media communications and various networking arenas. Prep Your Path LLC expressly agrees that it will not share any Client’s personal information (including name, telephone, email, and address) unless (1) Client grants permission to Prep Your Path LLC to use as a testimonial or sample, and (2) such information is ordered by local, state, or federal officials regarding investigation or a lawsuit. Prep Your Path LLC uses limited proportional emailing or notices to which you may unsubscribe at any time. We display personal testimonials of satisfied customers on our site in addition to other endorsements. With your consent we may post your testimonial. If you wish to update your testimonial, please contact Anne Finnegan: info@PrepYourPath.com. All text, graphics, user interfaces, visual interfaces, photographs, trademarks, logos, artwork, text, and computer code (collectively called "www.PrepYourPath.com Content"), including but not limited to the design, structure, selection, coordination, expression, "look and feel," and arrangement of such Prep Your Path LLC content is owned, controlled, or licensed by or to Prep Your Path LLC, and is protected by trade dress, copyright, patent, and/or trademark laws, and various other intellectual property and other rights. No Prep Your Path LLC Content may be used, copied, reproduced, modified, republished, uploaded, posted, publicly displayed, publicly performed, publicly performed by means of a digital audio transmission, encoded, translated, transmitted, or distributed in any way to any other computer, server, website, or any other medium for publication or distribution or for any commercial enterprise or purpose, without Prep Your Path LLC express prior written consent. Prep Your Path LLC is not responsible for the Client use or nonuse of writing materials or services. The Client is solely responsible for the use of all information and services, and agrees to hold Prep Your Path LLC harmless as a result of any actions taken or not taken. Prep Your Path LLC is not liable for any inaccurate, incorrect, or misleading information provided in prepared materials or coaching advice. The Client is required to review the materials and approve the entire content prior to final delivery. Prep Your Path LLC will not confirm or attempt to verify information provided by the Client, and will not be responsible for the accuracy or truthfulness of the information provided by Client. Prep Your Path LLC is not responsible for consequential damages that the Client may incur from inaccurate documents while enlisting services from Prep Your Path LLC. For any dispute you may have with Prep Your Path LLC, you agree to first contact us and attempt to resolve the dispute with us informally. If Prep Your Path LLC is not able to resolve the dispute with you informally, we each agree to resolve any claim, dispute, or controversy (excluding claims for injunctive or other equitable relief) arising out of or in connection with or relating to these Terms by binding arbitration by the American Arbitration Association (“AAA”) under the Commercial Arbitration Rules and Supplementary Procedures for Consumer Related Disputes then in effect for the AAA, except as provided herein. Unless Prep Your Path LLC and you agree otherwise, the arbitration will be conducted in Westchester County in the state of New York. The award rendered by the arbitrator shall include costs of arbitration, reasonable attorneys’ fees, and reasonable costs for expert and other witnesses, and any judgment on the award rendered by the arbitrator may be entered in any court of competent jurisdiction. Nothing in this Section shall prevent either party from seeking injunctive or other equitable relief from the courts for matters related to data security or intellectual property. All claims must be brought in the parties’ individual capacity, and not as a plaintiff or class member in any purported class, class action, or representative proceeding. Unless we agree otherwise, the arbitrator may not consolidate more than one person’s claims. You agree that, by entering into these Terms, you are waiving the right to a jury trial and the right to participate in a class action. Should the Client wish to file suit against Prep Your Path LLC, the jurisdiction/choice of law shall be in New York and each party shall bear its own costs in filing suit. You agree that, regardless of any statute or law to the contrary, any claim under this Agreement must be brought within one (1) year after the cause of action arises, or such claim or cause of action is forever barred. You agree that regardless of any statute or law to the contrary, any claim arising out of your use of our services must be filed within one (1) year after such claim arises. Prep Your Path LLC reserves the right to change these Terms from time to time at its sole discretion, and to modify, add, or remove portions of these Terms. This Site is managed by Prep Your Path LLC in Westchester Country, NY. If you have questions, please contact us at info@PrepYourPath.com. "Anne was extremely helpful in creating a professional and concise resume for my post-collegiate job search. She put in the necessary time to learn about my current role and help me choose the right pieces to highlight in my resume. I do not think I would have gotten the same interviews without Anne's help!"